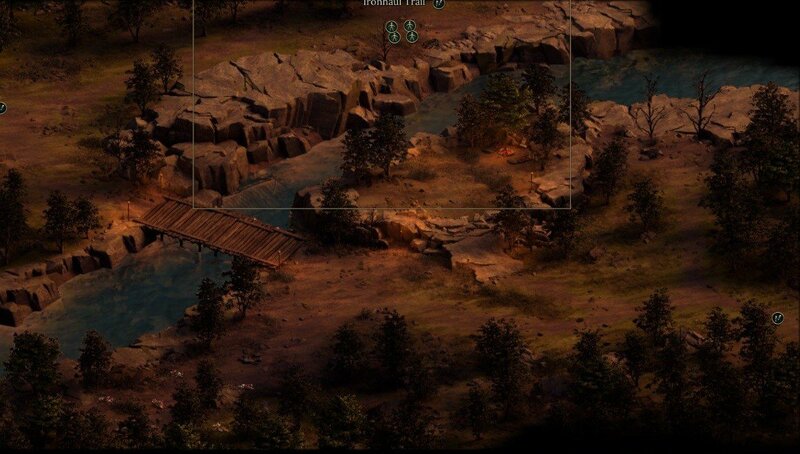 Ironhaul Trail is an location in Tyranny. You will be ambushed on the way to Lethian's Crossing, and will appear on the right side of the map. Head left and speak Welby. You can gain or lose some favor with the Bronze Brotherhood when you speak with her. Be sure to grab the Sigil of Cyclical Energies I from the chest. Next head down and speak with Will and Aster there. You must decided if you will let Will charge Aster a fee to cross the bridge or not. If you pay the toll you will gain favor with Lethian's Crossing but lose 50 Copper Rings. If you tell Will that Aster will not pay, you will gain favor with Lethian's Crossing. If you insist he doesn't pay Aster will leave and you will gain wrath with the Bronze Brotherhood. You will have the option to let Verse beat the ***** out of Will to let you pass, but you will gain wrath if you do this. Alternatively you can speak with Will yourself. Raetomonnon will then appear and depending on what you did during Conquest he will be happy or unhappy to see you and you will gain wrath or favor with the Bronze Brotherhood. You can gain favor or lose favor with the Bronze Brotherhood depending on what you say here. You can promise to behave and he will let you accross or you can attack. Promising to behave will unlock Lethian's Crossing on the map. Yeah I&apos;ve discovered if you attack them and subsequently purge Lethian&apos;s Crossing of the Bronze Brotherhood....the questline just ends there, Raetomonnon runs away at Ironhaul Trail and never comes back, besides grabbing Sirin and the Spire, nobody really says ***** in the crossing and nothing ever happens there from that point on. Also Will&apos;s name links to the stat page.